Which scoundrel should I zeta? So quick update. I've zeta'd Vandor, Qira, and both of OT Chewie's zetas. My Mission and Zaalbar are strong enough to play game and warrant zetas. A guildmate suggested I zeta my Enfys Nest first though. She's only 5* and G10 but I'm told she'll be a pain to fight against with that zeta. I'm thinking of putting the zeta on Mission instead. Thoughts? I build teams that I think the AI can't muck up on D. I think the AI can mess up with her zeta. I dont want her to avoid taunt. I want her to clear the taunt so my whole team can avoid it. With the zeta she will hit people other than the tank. Without it she is forced to use her wipe on the tank - freeing up the whole team to attack others. Nest is most useful to me on D. AI controls D. Thus, I didnt zeta her. Just my personal opinion. Many probably wont agree. Missions zeta is foolproof though and I highly recommend it. Not Only does she do great damage but she spreads daze and dots. AI cant mess it up as its passive. My Qira Z Mission YHan Hyoda got 2M on P2 of our first try at heroic Sith. The team can do way better than that. 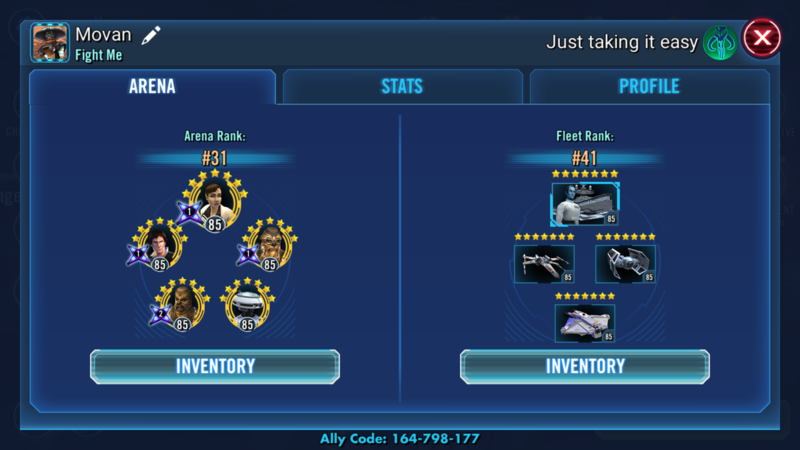 Personally, I’ve got Mission and Zaalbar fully done and Clone Wars Chewie making a decent defensive leader. (To VonZant’s point, Qi’ra and the prepared mechanic is hard for the AI to use well). So that frees up Qi’ra and Nest to switch to offence where they can do unnatural things to Bastila teams left on defence! For the full experience, I’d take a look at the Scoundrel Discord server where Clash and co. can tell you how it really works!! I put the zeta on nest and zaalbar. Nest and zaalbar are both worth it. The health steal on the nest zeta is worth it. One hit and she is back at full health. The taunt ignore is very beneficial on offense and doesn't really screw up defense. Overall, zaarbal and mission are better zetas though. Another consideration, if you run l3, consider switching out nest and plugging in t3. T3 needs both zetas though. All of l3s counters along with t3s zetas makes l3 hit hard, and all the time. There. Replace RHan and Chewie with Mission and Z and you should have a good team for TW this week. I want that squad! Nice. Thanks, guys. My T3 is only 5* and being farmed still. I'll put Enfys on the backburner and go for Mission. Do you guys use the Mission+Zaalbar team in P2 of the Sith Raid? Any feedback? The zeta on nest is really useful for the health steal. Makes her much more annoying to deal with when she counter attacks and returns to full health. The avoiding taunt I find is really not all that useful, she mostly strips taunts on her counter attacks anyways, however it can be very nice to use her high dps special on a character that just got protected by a taunt or two before the enemy can heal up. Who are you using on these teams? Yep - spot on. Han and Chewie plus a tank, can make that +3 pretty nasty if you want it to be. A guarded Qi'ra, with some speed, moves a lot!